But the Donald Trump White House has brought Big Oil capture of government to a new level, choosing Exxon Mobil CEO Rex Tillerson as Secretary of State, as well as appointing other fossil fuel industry insiders to his cabinet. 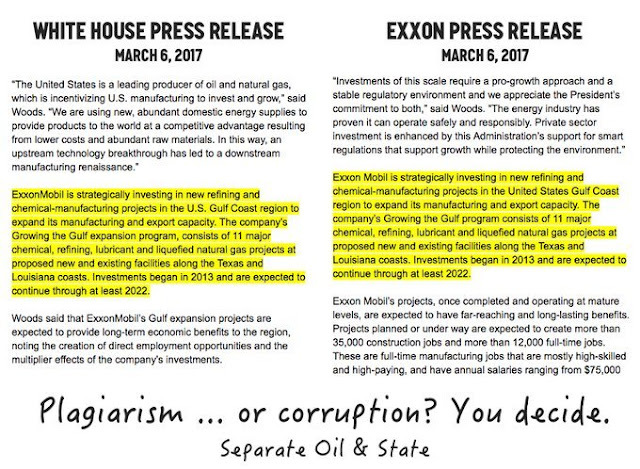 Now the White House is copying Exxon Mobil press releases. The only difference between the two paragraphs is that the White House has separated “Exxon Mobil” into two words in their release. Welcome to the United States of ExxonMobil and Big Oil.